Q-Connect Feint Ruled Counsels Notebook 96 Pages A4 (Pack of 10) KF01390 Pack of 10 Q-Connect Counsels Notebook features Blue manila cover with forty-eight sheets of 70gsm White feint ruled perforated sheets. A4 297x210mm. Cambridge Everyday Ruled Counsels Card Cover Notebook A4 (Pack of 10) 100105941 Pack of 10 Cambridge Counsels Notebook. Blue covered books with White ruled perforated paper and 96 pages. 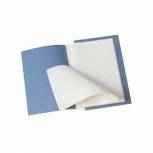 Q-Connect Feint Ruled Counsels Notebook 96 Pages 330x203mm (Pack of 10) KF01391 Pack of 10 Q-Connect Counsels Notebook features Blue manila cover with forty-eight sheets of 70gsm White feint ruled perforated sheets. Foolscap.